So far in the saga that is Call of Duty: Ghosts, the fun factor of the game has increased tremendously through the first two map packs -- Onslaught and Devastation, which allow you to play as Michael Meyers and Predator, respectively. Slowly but surely Infinity Ward has been addressing concerns from Ghosts, adding in more interesting locations on top of a ton of little extras that add up over time. Although Invasion doesn't have a gimmick as strong as say, a playable horror or action movie villain, its tricks are more spread out over the entire DLC, making for one of the best map packs yet. You won't find any new guns in the newest Ghosts DLC. This time around, the creators have decided to give all of their levels a twist -- every one takes place in a real-life geographic location. 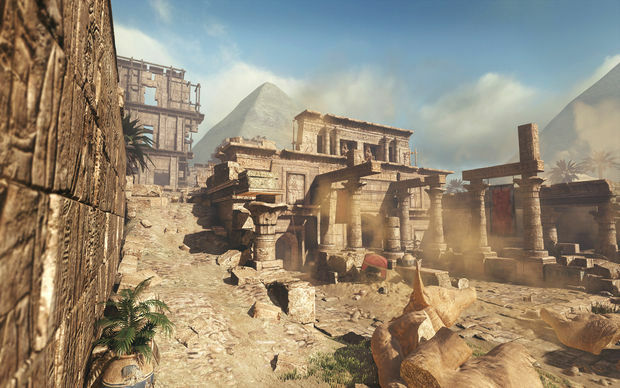 With Mexico, Egypt, the Caribbean, and Brazil on display, there's a lot of potential to really show off, which Infinity Ward does in spades. First up is Departed, a take on a Mexican town during a Dia de los Muertos (Day of the Dead) parade. Consisting of three lanes, this detailed, colorful map is a mix of old- and new-school Call of Duty sensibilities, with tons of rooms to hide in as well as open spaces to run through. It's a ton of fun to play as danger lurks at nearly every corner, which keeps things exciting. 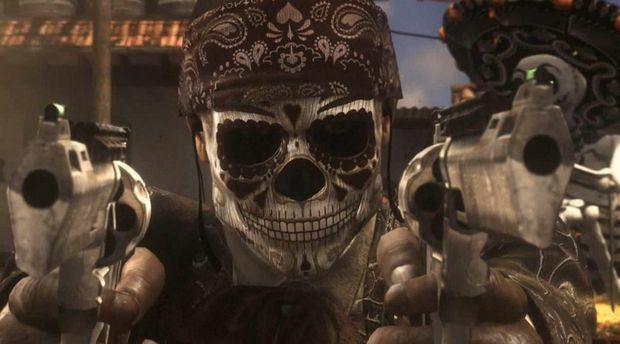 The special killstreak reward here is the "Death Mariachi," which grants you dual pistols with extra firepower. It's not as cool as transforming into the Predator, but it's still a worthy killstreak that makes sense within the confines of the level itself. In other words, you're going to remember it. Pharaoh, if you haven't guessed already, takes place in Egypt, on the site of an ancient tomb. Simply put, it's one of the most detailed maps in Call of Duty history, and blew me away almost immediately. There's dust clouds, cobwebs, and archaeological tools strewn about everywhere, and you can clearly tell the team spent a lot of time on it. Heck, there's flesh-eating scarabs and a few environmental hazards to keep things fresh as well. The killstreak gimmick here is the Blessing of Anubis, which grants one player every perk in the game for a few subsequent lives. It's really fun because it's not quite as overpowered as other streaks, especially when you consider that one quick headshot is all it takes to down you. I managed to grab it a few times and had a blast playing with it. 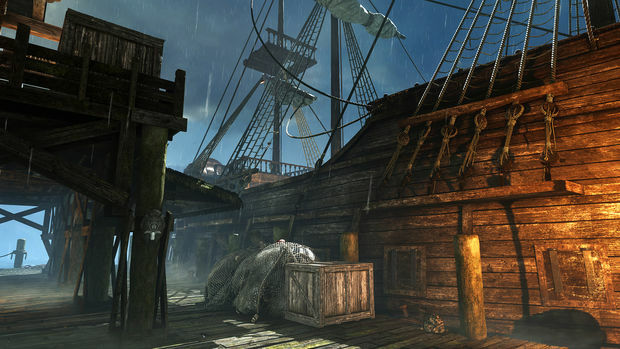 Mutiny takes place in the Caribbean, with a clear nod to the Pirates film series. There's ghost pirate and cannon fire killstreaks, taverns, docks, and a medium-sized ship to roam around in, all set to the tune of a moonlit night. I love the dark theme most of all as Ghosts -- or any Call of Duty game, for that matter -- has a distinct lack of night themes. There's also a lot of details here as well, like the abandoned bar with skeletons on the floor, where you can hear the faint whispers of ghosts. The map itself isn't as strong as the others from a pure layout standpoint, but the thematic elements alone make this one worth playing. 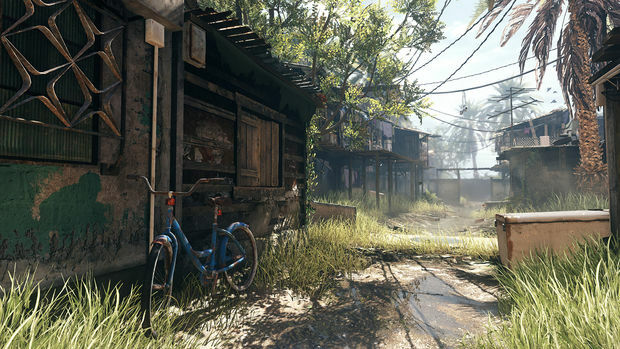 Finally, Favela makes its triumphant return from Modern Warfare 2 as the token remake map of the pack, and thankfully Infinity Ward picked one worth bringing back. This is the same old rooftop and tunnel-heavy map fans know and love, but with a bit more flair and attention all around. There are new environmental sound effects in tow, as well as general decorations that help it stand out a bit more. I'm not thrilled that Activision charges $15 for its map packs when you consider that one of the pieces is almost always a remake, but as far as remakes go this is one of the more acceptable inclusions. If you haven't been following along, Infinity Ward has its own version of Nazi Zombies now with aliens, called Extinction -- and just like its prior Ghost DLCs, there's a new map. Awakening takes place in an area called "The Cortex," where teams are tasked with decoding alien obelisks instead of drilling into nests. You'll get more of the overarching story (told through a cutscene), as well as new intel to find to help tie up all the loose ends from the core narrative. The Cortex is distinct from the other more realistic settings (a town, a military base, and a ship) thanks to an area I like to call "Mushroom Hell." The area is completely devoid of human influence, and the time has come to enter the belly of the beast and see your enemy up close. It also has a more occult feel to it which I really dig. Of course, new aliens are at the ready to stop you. The most notable additions are two types of winged aliens -- Gargoyles and Bombers, which are a crucial addition to the existing stable of creatures. Now you'll have to deal with enemies from every location, which helps keep you on your toes and enhances the action overall. You'll also have to cope with the Mammoth species on foot, making this one of the toughest Extinction challenges yet. 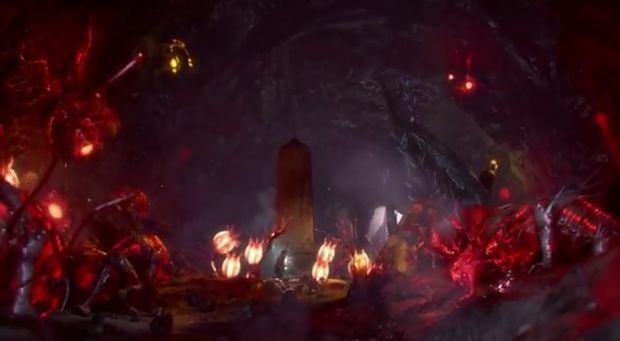 So far, Extinction feels like a more arcade-oriented version of Treyarch's Zombies, which is good or bad depending on what you're looking to get out of it. But one thing's for sure, Infinity Ward has made it much easier to get into the mode from the ground floor, and it's not nearly as tough on new players as Nazi Zombies is. Extinction mode is as strong as ever, but the real star of Invasion is the collective of welcome maps. 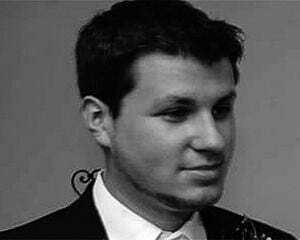 Infinity Ward has finally learned that in order to charge $15 for five levels, it has to put forth more than a minimal effort. I'd go so far as to say that this is one of the strongest map packs in Call of Duty history, and that the Season Pass has cemented its worth already.